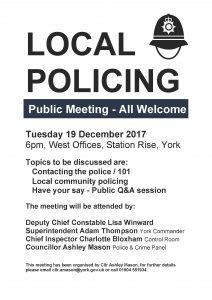 There will be a Bishopthorpe Ward Committee meeting for residents at 19.00 on Tuesday 14 November at Acaster Malbis Village Hall, Mill Lane, Acaster. This will be chaired by Cllr John Galvin the Ward Councillor. 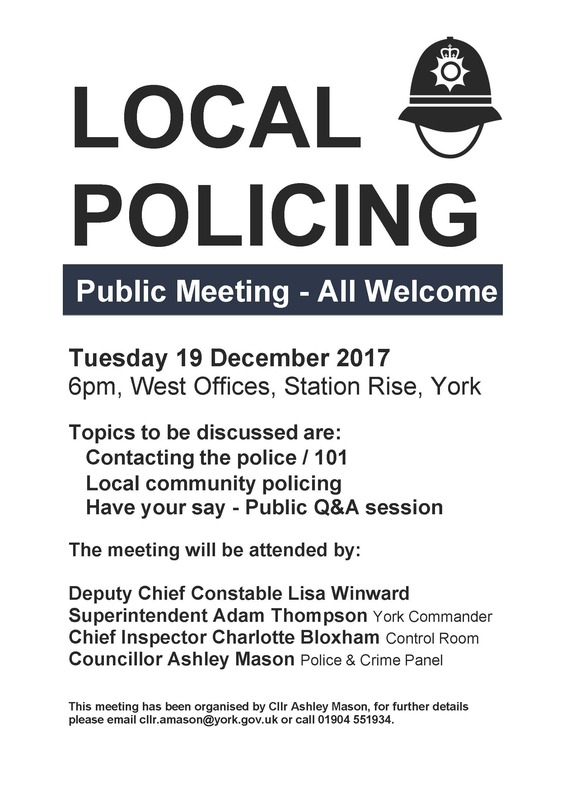 All residents of Bishopthorpe are welcome to attend. – Police update – general issues and speeding (tbc). – Neighbourhood enforcement matters – Jackie Armitage (Neighbourhood Enforcement Officer CoYC). – Parking enforcement issues – Graham Titchener (Head of Parking Services – CoYC). – Find out more about ward budgets and grants. Bishopthorpe Parish Council’s annual Youth Award scheme has run each year since 2001. Two awards of £150 are made each year to young people aged 11 to 18. Members of the Parish Council’s Youth Awards Committee make contact annually with local groups and posters are displayed round the village inviting nominations of young people from the village who have helped others during the previous year. The Youth Award is presented to the two successful nominees at a ceremony in the Village Hall with their families and friends invited to attend. Their names are inscribed on a plaque that hangs in the entrance foyer at the Village Hall. In 2012 the Parish Council contacted all previous award winners to ask about their lives since winning the award. It was clear from many of those who responded with an update that they have continued to help and support others both in professional and voluntary capacities. At times there have been few nominations or none but nevertheless the scheme has been a success. Previous winners have been recognised for working with young and older people, within the church, school or organisations in the village and the wider world. Anyone, including parents, friends, relations, teachers or employers may nominate a young person by explaining why they believe they deserve an award. Previous nominees – other than winners – can be nominated again. The closing date for nominations will be 15 December 2017 and further details will appear in Link nearer the time and on posters around the village. So – please look around at the young people in the village and the Parish Council looks forward to receiving your nominations. 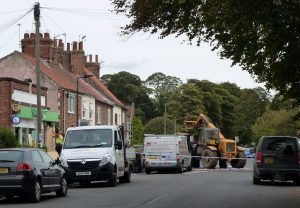 Send them to The Parish Council Clerk at Bishopthorpe Village Hall, Main Street, Bishopthorpe. 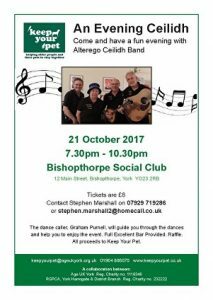 Come along for a great fun evening with the Alterego Ceilidh Band, in support of Keep Your Pet. Keep Your Pet helps older people and their pets to stay together at times of illness or other emergencies. See our Purple Pages entry for more details. Ram-raiders stole a JCB and used it to rip out the ATM from the front wall of the Co-op store in Main Street. 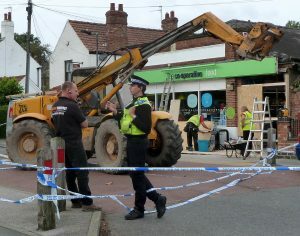 The theft occurred at about 3.05am today; fortunately, no-one was hurt. The JCB was abandoned in front of the shop and, it is reported, the ATM was driven away in a white Ford Transit van in the direction of Acaster Malbis. Police investigating the theft have seized CCTV as evidence. Later this afternoon, the wide hole left in the wall was being temporarily fixed. The store re-opened about 3.30pm. The police urge anyone with information that could assist the investigation to telephone North Yorkshire Police on 101, select option 2, and ask for the York Serious Crime Team. There are plenty of hold-ups on Main Street these days – but none quite like this one! 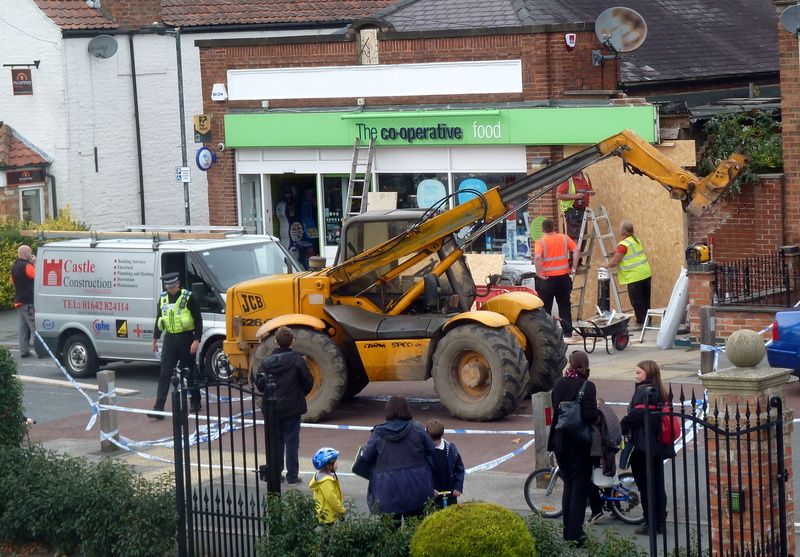 The scene outside the Co-op attracted spectators throughout the day.